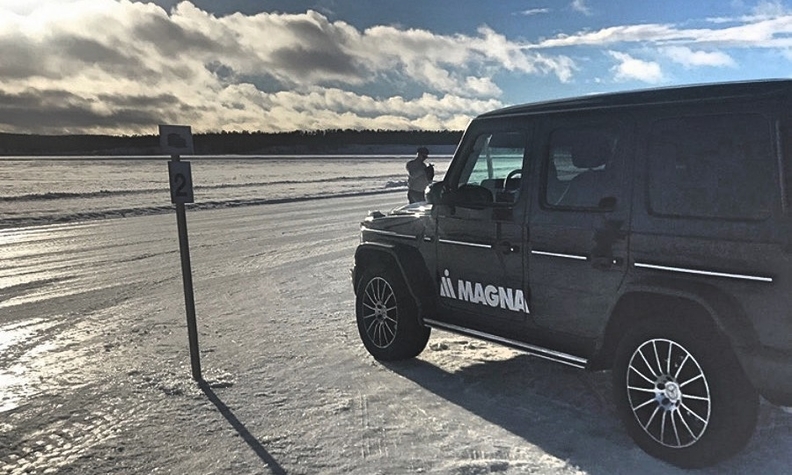 A vehicle outfitted with Magna’s e1 drive technology goes around a frozen skidpad. RJEPLOG, Sweden — Electric vehicles are a linchpin of strategies to limit emissions and slow global warming, but they only help if people drive them. Put another way, will consumers who have to grapple with challenging weather conditions value the driving dynamics of hybrids and EVs beyond those made by Tesla? 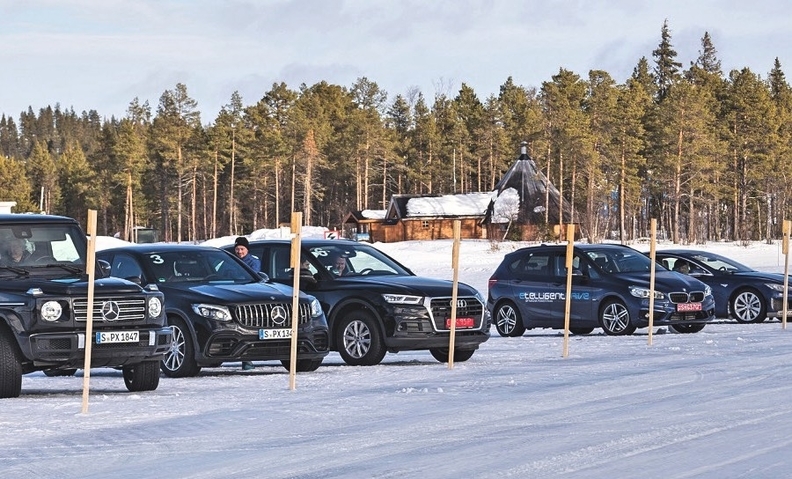 It's a question that explains why engineers from Magna International Inc. spent several weeks this winter shimmying around a frozen test track in the northern reaches of Sweden. 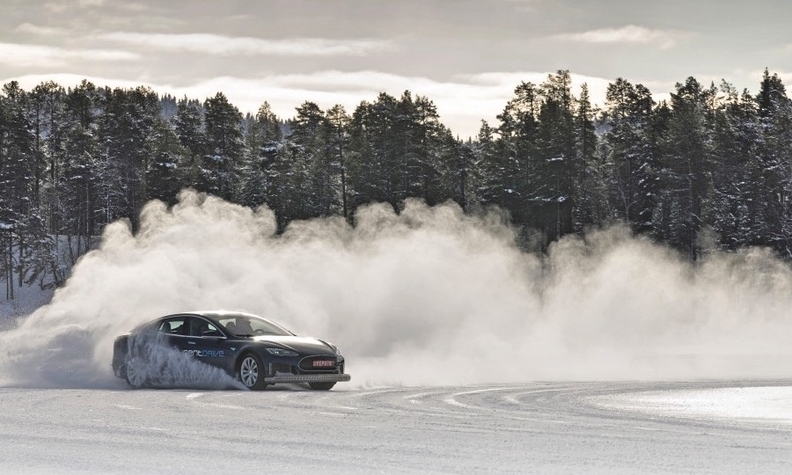 From vehicles with electrified components to a brand-new prototype, they tested their hybrid and electric mettle across a range of harsh driving and cold-weather conditions. Magna engineers tested hybrid and electric vehicles across a range of harsh driving and weather conditions. One standout among a group of a half-dozen specially equipped cars is a BMW 218i outfitted with Magna's e2 Technology Demonstrator. The car comes equipped with a hybrid all-wheel-drive system with a gasoline engine and hybrid transmission, but with the e2 system, it can demonstrate 10 combinations of electric drive. "It's a Milky Way approach," says Carsten Bünder, director of global product management for Magna Powertrain, meaning its versatile enough to span a galaxy of vehicles. "With this, we can simulate anything from an entry-level budget technology up to the top architecture." The skinny on the e2: It contains a hybrid dual-clutch gearbox and an electric rear axle with torque vectoring that can be enabled across different power ranges. In operation, integrated torque vectoring provides a remarkably stable ride while the vehicle circles the ice-laden skidpad at about 40 mph, then 50 mph. There's little to no understeer or oversteer. With the system turned off, a novice test-course driver — confession, yours truly — goes spinning like a pinwheel into the side of the track. Similar results are found in an earlier prototype of similar technology, the e1, in a Tesla Model S. The torque vectoring allows a driver to remain firmly in control as we drive around the skidpad and another icy course filled with twists and turns. They're convincing demonstrations that electric-drive technology can help people drive better. From a manufacturing standpoint, Magna intends to show that it can provide flexible solutions for automakers at scale, at a time when regional governmental initiatives are leaving OEMs feeling uncertain. "Which concept makes the most sense, when and where, depends on the respective needs of the automakers and their specific customers," said Walter Sackl, global director of product management with Magna. "That's where Magna excels, with our scalable building-block approach." The nods to scale and a modular approach come as Magna and pretty much every other supplier wrestles with the complexity that electrification has already injected into both short- and long-term strategies. Magna executives say they support six internal-combustion powertrains, including those with start-stop technology. By contrast, they count 42 electric powertrains either in development or already in use across the globe: 21 mild hybrids, 17 hybrid electric plug-ins and four battery electrics. The company says it supports 29 of the 42. Magna's push reflects that electric vehicle sales are projected to flourish. A record 1.1 million were sold worldwide in 2017, and Bloomberg New Energy Finance forecasts that 11 million will be sold in 2025 and 30 million a year by 2030, after they become cheaper than cars equipped with internal-combustion engines, according a recent report from the Bloomberg research firm. Demand could vary greatly by region, as might the need for steppingstone technology. Bünder says uncertainty in legislation, OEMs' desire for differentiation and questionable levels of end-consumer interest — with emphasis on the North American trend toward SUVs and pickups — underscore the need for flexibility. But overall, he's preparing for a future that emphasizes electric. "We're shifting from scalable ICE power to scalable E power," Bünder said. "And we need to reduce that complexity for OEMs."